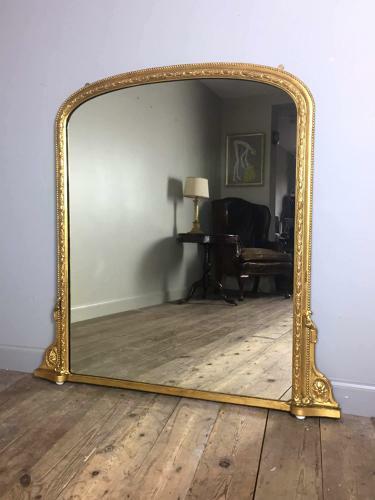 A classic and stylish curved topped overmantle giltwood mirror, having a moulded surround with beaded decoration, flanked by intricate floral decoration to the base and raised on the original squat porcelain feet. Retaining the original mirror plate and back boards. English, Circa 1870. Dimensions: Height: 133.5 cm (52 1/2 Inches), Width: 132 cm (52 Inches).